Knee Capsule Violation: bedside rule out test? 33 year old male presents to the ED complaining of knee pain and laceration 3 hours after crashing his road bike while cycling. The patient does not have any past medical or surgical history, does not take any medications, denies hitting his head, and has been able to bear weight on the affected leg. Walking, active knee flexion and extension produce pain. Examination of the left knee reveals a deep, horizontal oblique 5 cm laceration extending from medial to lateral over the patellar tendon. Physical exam is normal. However, even after copious irrigation and exploration, violation of the joint capsule cannot be excluded. What bedside test could be performed to confirm that the joint capsule is intact? Intra-articular injection with normal saline with or without methylene blue dye has been advocated as a bedside test to determine if the joint capsule has been violated (Sandford, 2013). However this test needs to be done properly with correct interpretation of the results. In order to maximize the sensitivity of the test approximately 175-200 mL of normal saline should be used and the knee slightly passively flexed and extended as tolerated by the patient. Normal saline should be injected in the same manner you would drain an intra-articular effusion with the patient supine with the knee extended. Inject the saline and watch closely for extravasation. As tolerated by the patient, gently take the knee through a slight passive flexion and extension. For patient comfort, remove fluid at the end of the test (Sandford, 2013). In one study (N= 30) with surgeon induced knee arthrotomy, a saline load of 194 mL was required to achieve 95% sensitivity (Keese, 2007). Another study, performed under similar conditions, found that 155 mL of normal saline were needed to capture 95% of cases. In this study the surgeons passively flexed and extended the knee while the patient was under anesthesia (Nord, 2009). This maneuver decreased the amount of saline needed to achieve similar sensitivity. In a single study of 50 patients with a traumatic knee wound the saline test was used to make the diagnose of traumatic arthrotomy. Evaluation of the knee in the operating room was performed to confirm the diagnosis. The mean saline load volume used was 74.9 cm +/- 28.2 cm. The authors concluded that the saline load test was 94% sensitive, 91% specific with a false-positive rate of 9% (Konda, 2013). These results should be interpreted cautiously however as it has not consistently been replicated. Does methylene blue improve sensitivity? In a single study (N=58) of patients undergoing elective arthroscopy, there was no significant difference between 180 mL injection of normal saline versus normal saline + methylene blue. 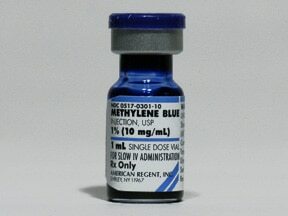 Addition of methylene blue to normal saline did not affect the sensitivity of the test (Metzger, 2012). Violation of the joint capsule is considered a surgical emergency. Missing this diagnosis could be devastating. Fortunately, CT scan has shown to have a high sensitivity for detecting intra-articular free air associated with joint capsule disruption. In another small study (N= 62 patients; 63 knees), patients with traumatic knee wounds were evaluated with CT scan. A subset of these patients (37/62) underwent saline load test. All 32 knees that had intra-articular air on CT scan were OR confirmed traumatic knee arthrotomy. Of the 31 patients without intra-articular air on CT scan, none were found to have a knee infection at mean follow-up of 291 days. The sensitivity and specificity of CT at detecting traumatic knee arthrotomy was 100%. In the subgroup that underwent saline load test, the sensitivity of CT was 100% versus 92% for the saline load test (p < 0.001) (Konda, 2013). In the setting of traumatic knee injury with possible violation of the joint capsule, saline load test is a reasonable option. Maximize your sensitivity and specificity by injecting 175 -200 mL of saline (assuming the patient can tolerate that amount). Methylene blue does not increase the sensitivity. Gently take the knee through a passive flexion and extension to increase sensitivity and decrease amount the amount of saline needed. In the setting of high clinical suspicion but a negative saline load test, CT scan looking for intra-articular air is a reasonable option. Exploration of the joint in the OR is the definitive test to rule out joint capsule violation. Sandford A. Arthrocentesis. In: Roberts JR. Roberts and Hedges' Clinical Procedures in Emergency Medicine, Expert Consult - Online and Print. W B Saunders Company; 2013. Keese GR, Boody AR, Wongworawat MD, Jobe CM. The accuracy of the saline load test in the diagnosis of traumatic knee arthrotomies. J Orthop Trauma. 2007;21(7):442-3. Nord RM, Quach T, Walsh M, Pereira D, Tejwani NC. Detection of traumatic arthrotomy of the knee using the saline solution load test. J Bone Joint Surg Am. 2009;91(1):66-70. Konda SR, Howard D, Davidovitch RI, Egol KA. The saline load test of the knee redefined: a test to detect traumatic arthrotomies and rule out periarticular wounds not requiring surgical intervention. J Orthop Trauma. 2013;27(9):491-7. Metzger P, Carney J, Kuhn K, Booher K, Mazurek M. Sensitivity of the saline load test with and without methylene blue dye in the diagnosis of artificial traumatic knee arthrotomies. J Orthop Trauma. 2012;26(6):347-9. Konda SR, Davidovitch RI, Egol KA. Computed tomography scan to detect traumatic arthrotomies and identify periarticular wounds not requiring surgical intervention: an improvement over the saline load test. J Orthop Trauma. 2013;27(9):498-504. Hi, very good review of penetrating knee joint injuries. Please note that once you attempt a saline load test of the knee, it is possible that the injection of saline into the knee may introduce air into the knee joint thereby giving a false positive result if a ct scan is performed afterwards. It is my recommendation that a low dose ct scan be used as the first line diagnostic test to rule a penetrating knee joint injury. It is less morbid than the painful saline load test and has better sensitivity and specificity.